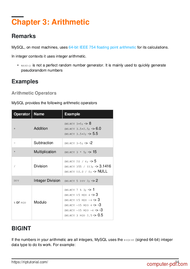 It is an unofficial and free MySQL ebook created for educational purposes. All the content is extracted from Stack Overflow Documentation, which is written by many hardworking individuals at Stack Overflow. It is neither affiliated with Stack Overflow nor official MySQL. The content is released under Creative Commons BY-SA, and the list of contributors to each chapter are provided in the credits section at the end of this book. Images may be copyright of their respective owners unless otherwise specified. All trademarks and registered trademarks are the property of their respective company owners. 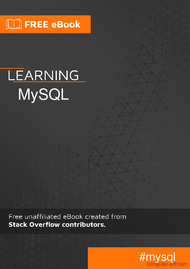 Description : Download free ebook Learning MySQL database, PDF course and tutorials extracted from Stack Overflow Documentation. It is never too late to start learning and it would be a shame to miss an opportunity to learn a tutorial or course that can be so useful as Learning MySQL especially when it is free! You do not have to register for expensive classes and travel from one part of town to another to take classes. All you need to do is download the course and open the PDF file. This specific program is classified in the Database category where you can find some other similar courses. Thanks to people (like you?) Who share their knowledge, you can discover the extent of our being selected to easily learn without spending a fortune! Learning MySQL. is available for free by its author. But also many other tutorials are accessible just as easily! Computer PDF is also courses for training in MS Access, SQL language, MySQL, Oracle, PostgreSQL, SQL server, SQL DBMS, NoSQL, NewSQL, SQLite,Design and modeling, Administration, Backup and Restore and many others IT. You should come see our Database documents. You will find your happiness without trouble ! The latest news and especially the best tutorials on your favorite topics, that is why Computer PDF is number 1 for courses and tutorials for download in pdf files - Learning MySQL. and Database! Download other tutorials for advice on Learning MySQL. you will see! We will do everything to help you! And you dear surfers what you need? The best course and tutorial, and how to learn and use Learning MySQL. of course!